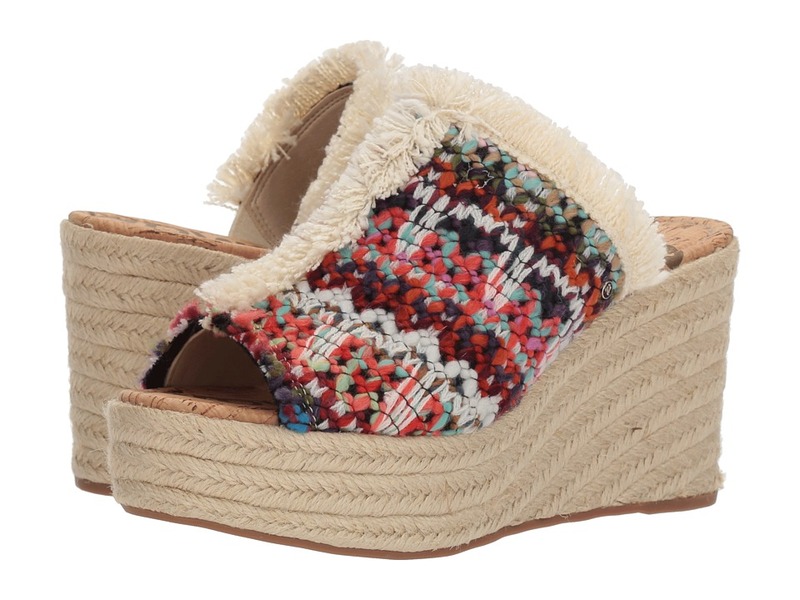 A cute, cozy and chic style to embellish your warm weather style, the Sam Edelman Dina 2 wedges. Upper made of woven and fringed fabric. Easy slip-on design. Man-made lining. Lightly cushioned, stationed insole. Espadrille-wrapped wedged heel. Platform style. Imported. Measurements: Heel Height: 3 1 2 in Weight: 13 oz Platform Height: 1 3 4 in Product measurements were taken using size 8, width M. Please note that measurements may vary by size. Weight of footwear is based on a single item, not a pair. 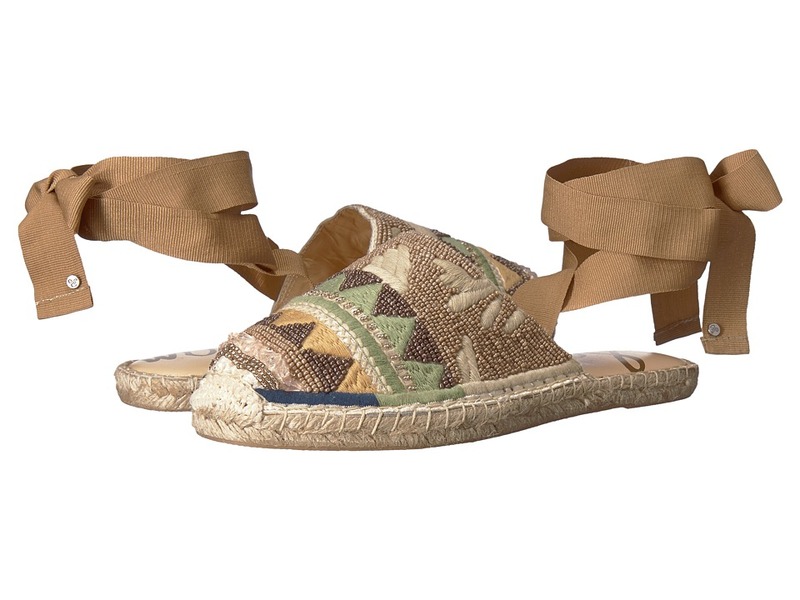 Propel your look with the refreshing Sam Edelman Dina, the perfect summer sandal. Upper made of canvas fabric with fringe detail. Easy slip-on design. Man-made lining. Lightly cushioned, stationed insole. Platform style. 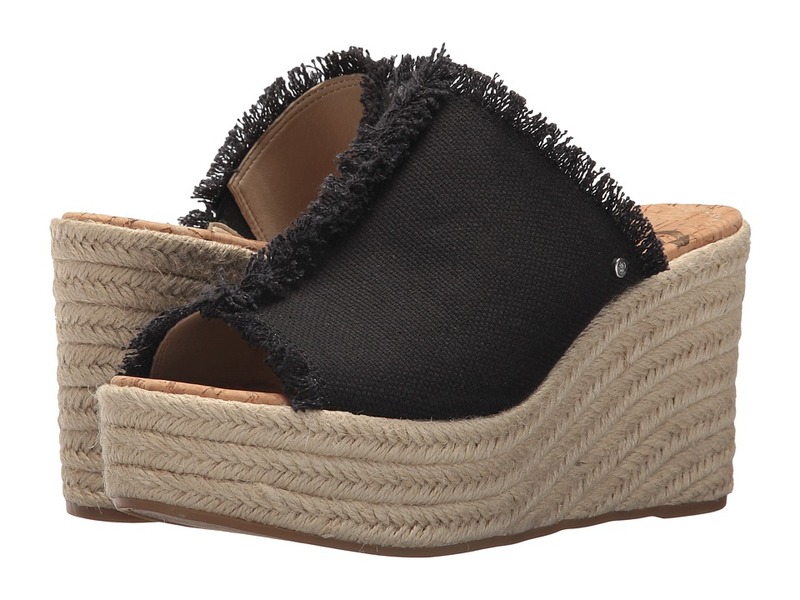 Espadrille wrapped wedge. Man-made outsole. Imported. Measurements: Heel Height: 3 1 2 in Weight: 13 oz Platform Height: 1 1 2 in Product measurements were taken using size 9, width M. Please note that measurements may vary by size. Weight of footwear is based on a single item, not a pair. Simplicity is always in style. 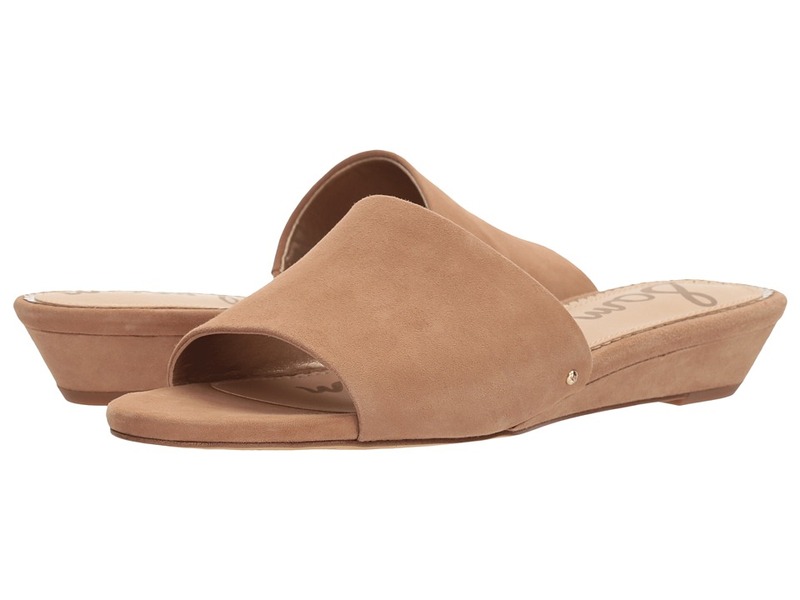 Keep your classic lines fresh and feminine with the Gertrude slide from Sam Edelman. Premium kid suede uppers. Slip-on construction Open, round-toe silhouette. Crisscross straps. Signature iconic metallic detail. Man-made lining and insole. Lightly cushioned footbed. Micro heel. Man-made outsole. Imported. Measurements: Weight: 5 oz Product measurements were taken using size 8, width M. Please note that measurements may vary by size. Weight of footwear is based on a single item, not a pair. 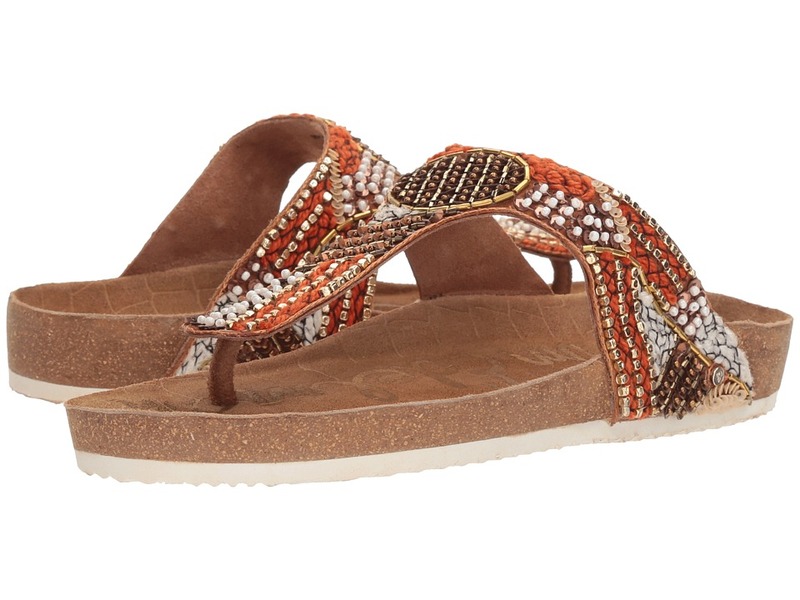 Sashay through your day with the carefree and casual Sam Edelman Gilly sandal! Premium saddle leather upper. Thong-style construction. Slingback strap with adjustable buckle closure. Round-toe silhouette. Scalloped vamp band with circular cutouts and polished metallic detailing. Synthetic lining and insole. Lightly padded footbed. Micro heel. Synthetic sole. Imported. Measurements: Heel Height: 1 2 in Weight: 5 oz Product measurements were taken using size 7.5, width M. Please note that measurements may vary by size. Weight of footwear is based on a single item, not a pair. Simplicity is always in style. 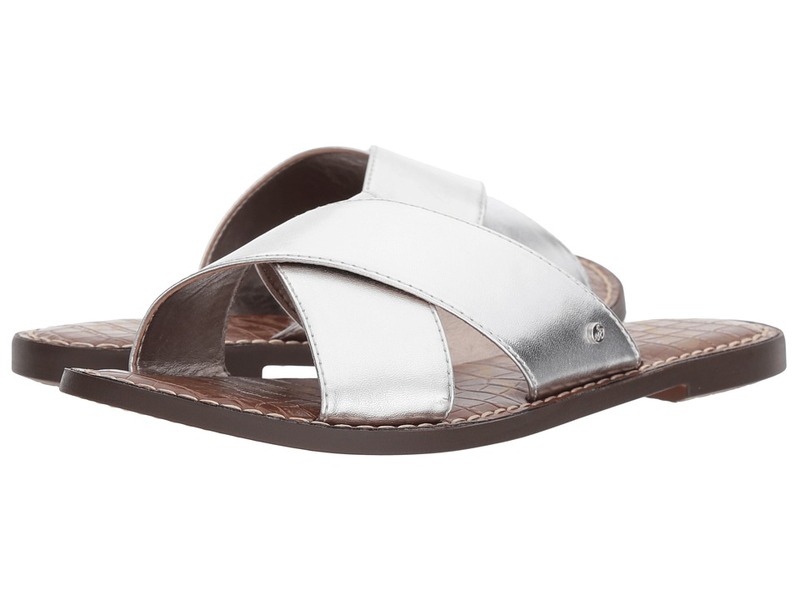 Keep your classic lines fresh and feminine with the Gio slide from Sam Edelman. Available in a variety of leather uppers. Slip-on construction Open, round-toe silhouette. Man-made lining and insole. Lightly cushioned footbed. Micro heel. Man-made outsole. Imported. Measurements: Heel Height: 1 2 in Weight: 5 oz Product measurements were taken using size 7.5, width M. Please note that measurements may vary by size. Weight of footwear is based on a single item, not a pair. 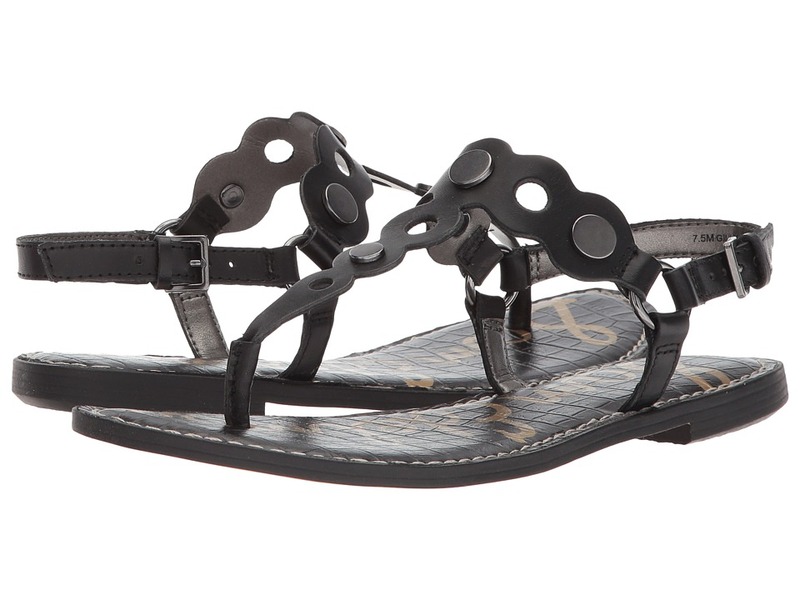 Sashay through your day with the edgy and effortless Sam Edelman Glade sandal! Supple suede upper with polished metallic stud detailing. Slingback strap with adjustable buckle closure. Round-toe silhouette. Synthetic lining and insole. Lightly padded footbed. Micro heel. Synthetic sole. Imported. Measurements: Heel Height: 1 2 in Weight: 6 oz Product measurements were taken using size 8.5, width M. Please note that measurements may vary by size. Weight of footwear is based on a single item, not a pair. 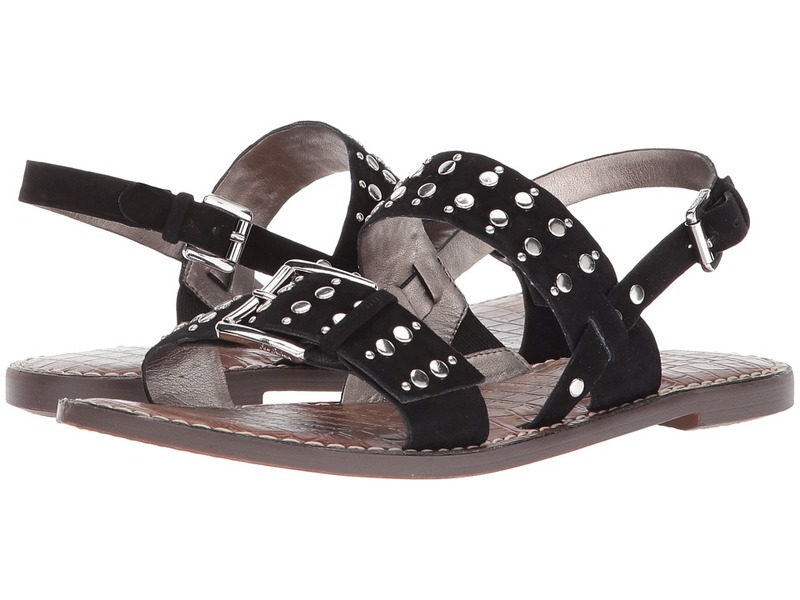 Stand out in a charming style that gives you a real edge, the Sam Edelman Jayne sandals. Upper made of leather with crossing strap detail. Easy slip-on design. Lining made of man-made material. Lightly cushioned, stationed insole. Platform style. Wrapped chunky heel. Man-made outsole. Imported. Measurements: Heel Height: 3 in Weight: 11 oz Platform Height: 1 1 4 in Product measurements were taken using size 7.5, width M. Please note that measurements may vary by size. Weight of footwear is based on a single item, not a pair. Kick your casual style into overdrive with the pretty Sam Edelman Jillian 3 mules. Upper made of woven and rhinestone detail. Easy slip-on design. Lining made of man-made material. Lightly cushioned, stationed insole. Man-made outsole. Imported. Measurements: Heel Height: 1 in Weight: 8 oz Product measurements were taken using size 9, width M. Please note that measurements may vary by size. Weight of footwear is based on a single item, not a pair. Make a fashionable mark with the cool Sam Edelman Jillian mules. Upper made of woven fabric and rhinestone detail. Easy slip-on design. Lining made of man-made material. Lightly cushioned, stationed insole. Man-made outsole. Imported. Measurements: Heel Height: 3 4 in Weight: 7 oz Product measurements were taken using size 7.5, width M. Please note that measurements may vary by size. Weight of footwear is based on a single item, not a pair. 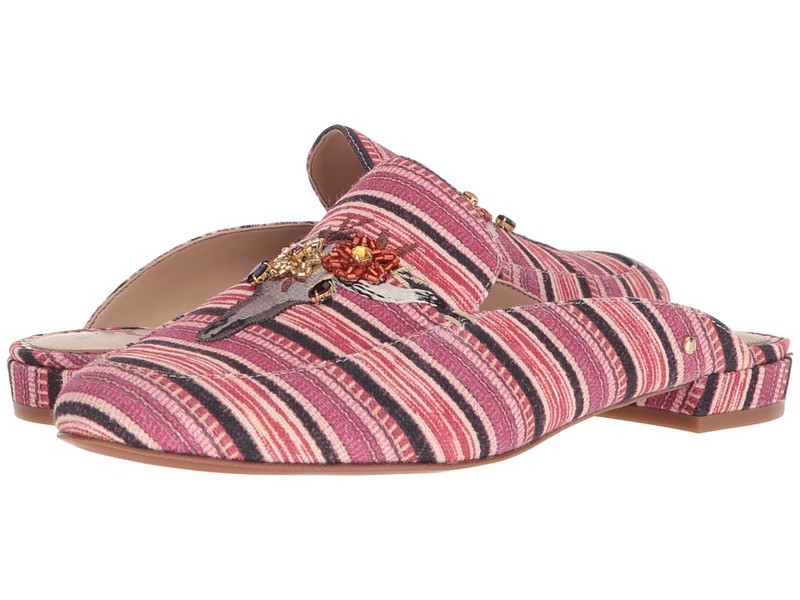 Meet Karolyn by Sam Edelman. Your daily to-do list has just gotten more stylish! 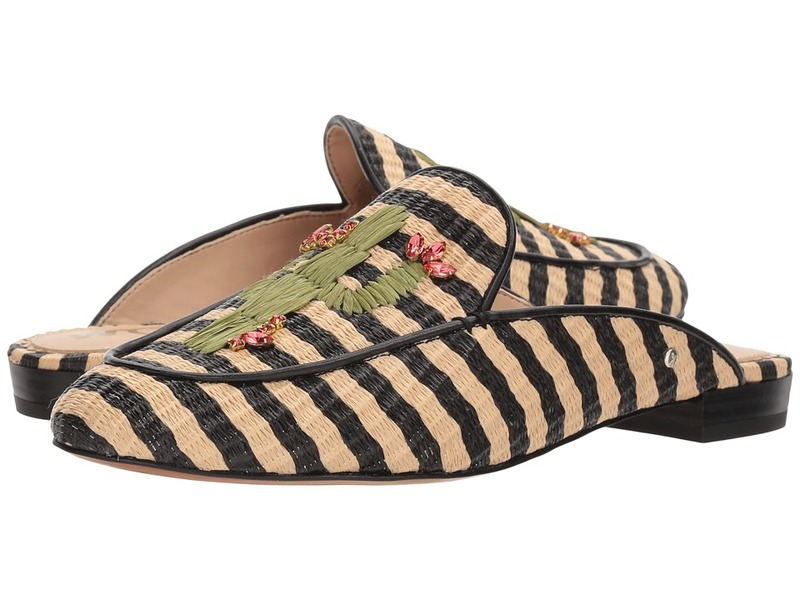 Contemporary trends and seasonal style come together in this playful espadrille. Beaded and embroidered textile upper. Ankle-wrap tie closure. Round-toe silhouette. Whipstitch detail. Lightly padded footbed. Jute-wrapped midsole. Rubber outsole. Imported. Measurements: Weight: 9 oz Product measurements were taken using size 8, width M. Please note that measurements may vary by size. Weight of footwear is based on a single item, not a pair. Meet Kerry by Sam Edelman. 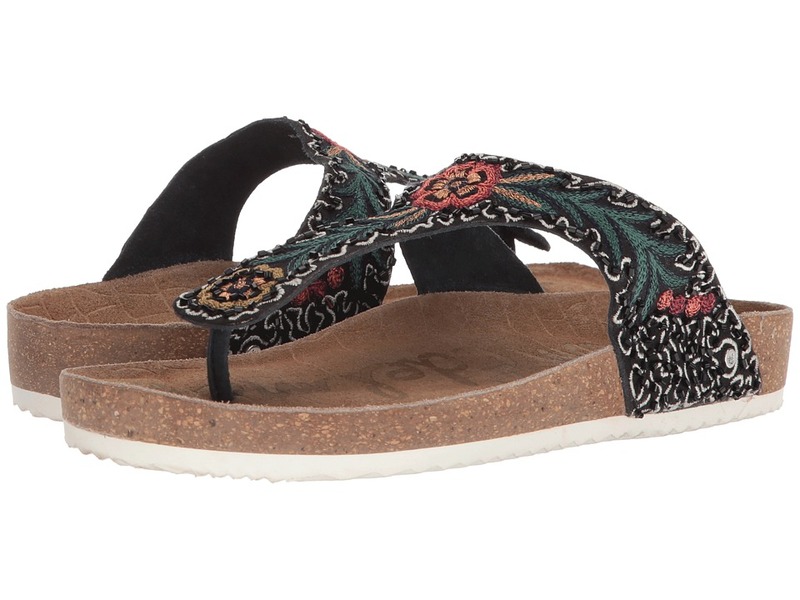 Contemporary trends and resort style come together in this espadrille! Available in a variety of premium uppers depending on colorway. Slip-on design. Round-toe silhouette. Lightly padded footbed. Jute-wrapped midsole. Rubber outsole. The Brahma hair colorway is made with real calf hair that has been artificially dyed and treated. Fur origin: China. Imported. Measurements: Weight: 9 oz Product measurements were taken using size 8, width M. Please note that measurements may vary by size. Weight of footwear is based on a single item, not a pair. 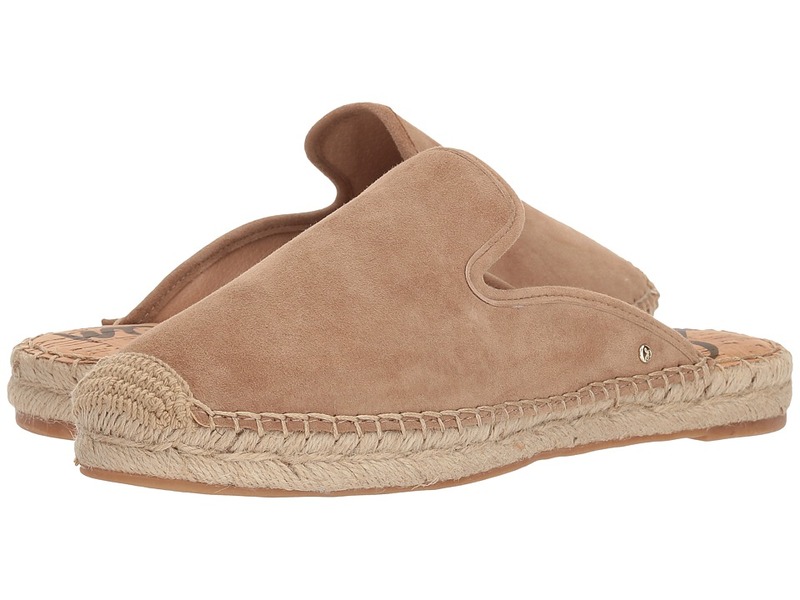 Keep your look cute and casual with these Sam Edelman Krissy espadrilles. 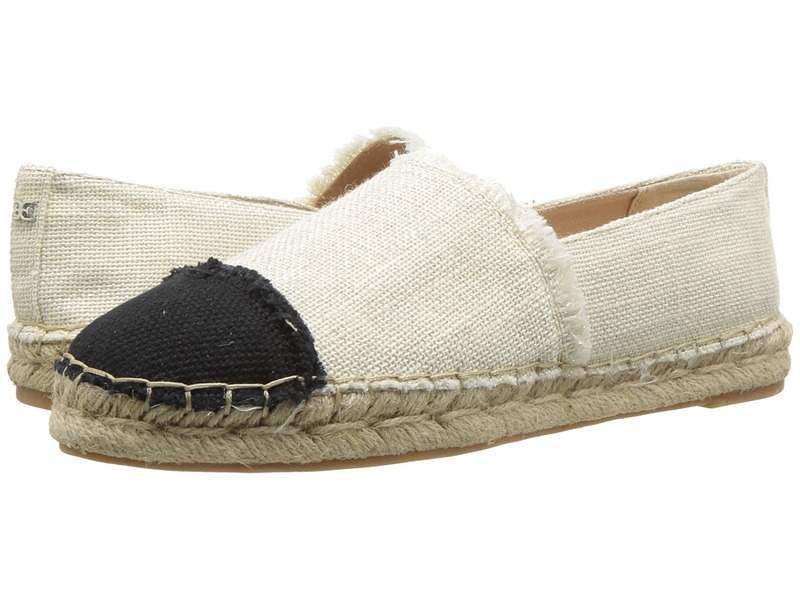 Espadrille flats with color-blocked, textile upper. Easy slip-on wear. Round toe. Frayed detailing. Synthetic lining. Lightly-padded, fixed footbed. Jute-wrapped platform. Synthetic outsole. Imported. Measurements: Weight: 10 oz Product measurements were taken using size 9, width M. Please note that measurements may vary by size. Weight of footwear is based on a single item, not a pair. Elevate your everyday look with the trending and transitional Sam Edelman Liliana wedge sandal. Available in a suede or woven textile upper depending on colorway. Slip-in entry. Round-toe silhouette. Iconic signature button branding. Man-made lining. Lightly-padded, fixed footbed. 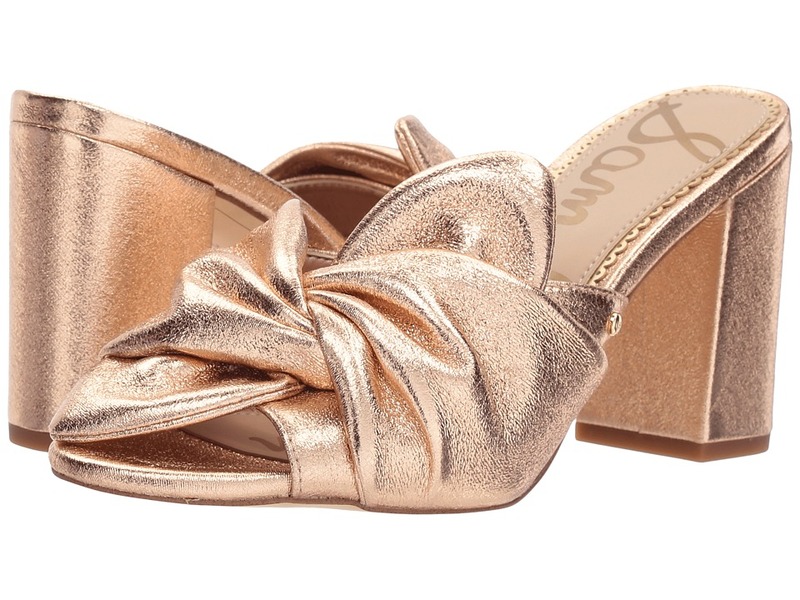 Wrapped wedge heel. Man-made outsole. Imported. Measurements: Heel Height: 1 1 4 in Weight: 6 oz Product measurements were taken using size 8.5, width M. Please note that measurements may vary by size. Weight of footwear is based on a single item, not a pair. Casual and classic! Elevate seasonal whites with undeniable eye-catching Sam Edelman Navya mule. Woven leather upper. Slip-in entry. Point-toe silhouette. Leather lining and insole. Lightly-padded, fixed footbed. Micro heel. Man-made outsole. Imported. Measurements: Heel Height: 1 2 in Weight: 5 oz Product measurements were taken using size 8, width M. Please note that measurements may vary by size. Weight of footwear is based on a single item, not a pair. Your springtime style just got an upgrade! Find your perfect finish this season in the Sam Edelman Oda heeled slide. Available in a variety of colorful textile uppers. Slip-on style. Round-toe silhouette. Twisted wrap vamp accent. Iconic signature button branding. Man-made lining. Lightly padded, fixed footbed. Block heel. Man-made outsole with rubber heeltap. Imported. Measurements: Heel Height: 3 1 4 in Weight: 11 oz Product measurements were taken using size 7.5, width M. Please note that measurements may vary by size. Weight of footwear is based on a single item, not a pair. Date night is like a fashion show in the psychedelic Sam Edelman Olive mules. Upper made of leather with intricate stitching detail. Easy slip-on design. Man-made lining. Lightly cushioned, stationed insole. Wrapped chunky heel. Man-made outsole. Imported. Measurements: Heel Height: 3 1 4 in Weight: 10 oz Product measurements were taken using size 7.5, width M. Please note that measurements may vary by size. Weight of footwear is based on a single item, not a pair. A freshly picked pair for the warmer season, the Sam Edelman Olivie 3 sandal, bold and beautiful. Upper made of canvas material with intricate beading detail. 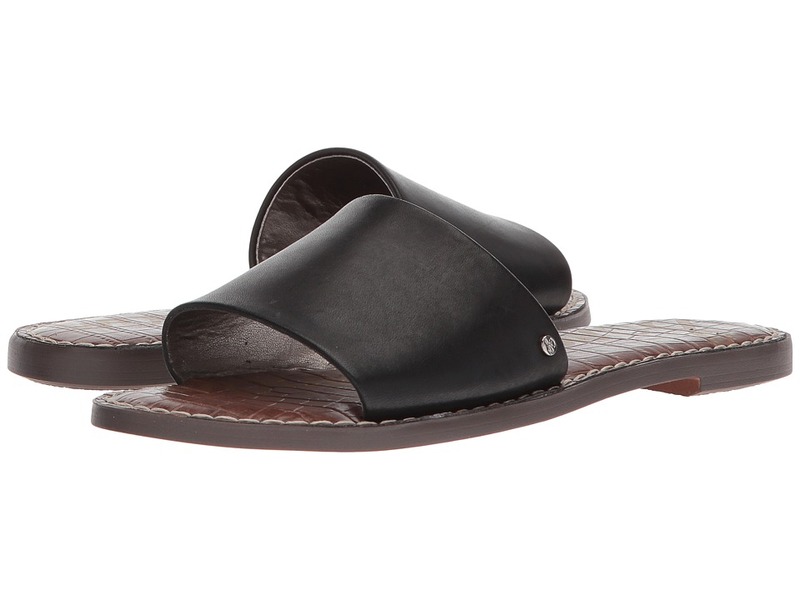 Easy slip-on, thong-style construction Lining made of leather. Lightly cushioned, stationed insole. Molded cork footbed. Textured rubber outsole. Imported. Measurements: Weight: 10 oz Product measurements were taken using size 9, width M. Please note that measurements may vary by size. Weight of footwear is based on a single item, not a pair. Flaunt chic style in an effortless way in the Sam Edelman Olivie 4 sandal. Upper made of canvas material with intricate beading detail. Easy slip-on, thong-style construction Lining made of leather. Lightly cushioned, stationed insole. Molded cork footbed. Textured rubber outsole. Imported. Measurements: Weight: 10 oz Product measurements were taken using size 9, width M. Please note that measurements may vary by size. Weight of footwear is based on a single item, not a pair.